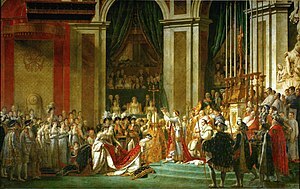 The French Revolution of the 1790s had led to the destruction of most of the ancient French Crown Jewels, along with the eventual abolition of the French monarchy and the execution of King Louis XVI and Queen Marie Antoinette. Originally, the Crown of Louis XV of France was supposed to have a completed collection of the Mazarin Diamonds, the Sancy diamond in the fleur-de-lis at the top of the arches, and the 'Regent' diamond, as well as hundreds of other precious diamonds, rubies, emeralds and sapphires. However, the Sancy diamond was not in the crown on the day of coronation. It was in the collection of Vasily Rudanovsky - a Russian art collector, who bought the diamond during the French revolution and then sold it in 1828 to Prince Demidoff. 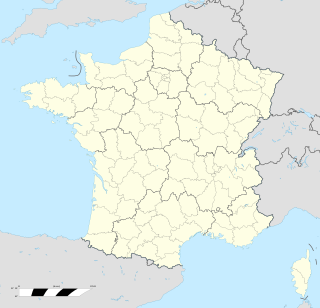 Despite the fact that Napoleon had managed to retrieve the “Regent” diamond from Russia, the absence of the “Sancy” was irritating. Diamonds had sacred royal meaning, and without it, the Pope risked being ridiculed by Napoleon’s court. When Napoleon declared himself Emperor of the French a decade later, he decided to create new imperial regalia, the centerpiece of which was his "Charlemagne crown". Napoleon on his Imperial throne (wearing his laurel leaf crown). painting by Jean Auguste Dominique Ingres in 1806. In the coronation itself, which took place not in the traditional location of French royal coronations, the Cathedral in Reims, but in Notre Dame in Paris, he actually used two crowns. Initially, he placed a laurel crown of the Roman emperors on his own head. Afterward, he briefly placed the imperial Charlemagne crown on his head, then touched it to the head of his empress, Josephine. As was the norm with European crowns, Napoleon's crown is made up of eight half-arches. They are set with shell cameos and carved carnelians which meet at a golden globe, on top of which is placed a cross. The crown itself is mock mediaeval in style, reliant totally on gold and metallic decoration and devoid of the major covering with diamonds and jewels fashionable in crowns made later in the 19th century. 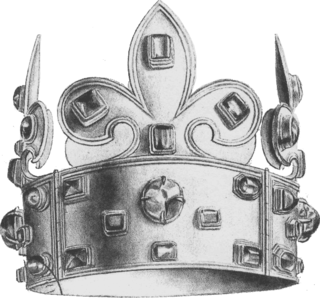 The Crown of Napoleon was used until his second overthrow in 1815. King Louis XVIII, brother of Louis XVI, was installed on the throne as King of France following Napoleon's overthrow. In contrast both to his brother and to Napoleon, the new king opted not to have a coronation. 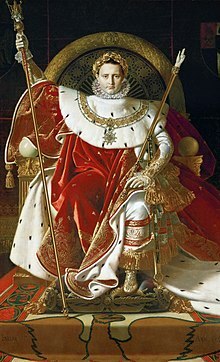 When his brother, Charles X became king in 1824, he reinstated the traditional monarchical coronation in Reims and was crowned using the remaining pre-revolutionary French royal crown, the Crown of Louis XV. No more French coronations, either imperial or royal, followed Charles X's overthrow in 1830. When Napoleon III proclaimed himself French emperor in 1852, he opted to neither have a coronation nor wear Napoleon I's crown. Nevertheless, a crown was created for Empress Eugénie, the Crown of Empress Eugénie. In 1885, to impede any further attempts at royal or imperial restorations, the French National Assembly opted to sell most of the French Crown Jewels. Only a handful of crowns were kept for historic reasons, and they had their precious jewels replaced in them by decorated glass. 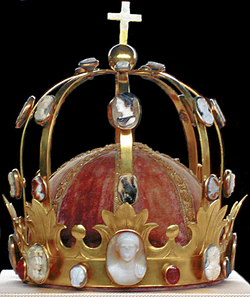 Napoleon I's crown was one of the few kept. It is now on display in the Louvre museum in Paris. Year 816 (DCCCXVI) was a leap year starting on Tuesday of the Julian calendar. The Palace of Fontainebleau or Château de Fontainebleau, located 55 kilometres southeast of the center of Paris, in the commune of Fontainebleau, is one of the largest French royal châteaux. The medieval castle and subsequent palace served as a residence for the French monarchs from Louis VII to Napoleon III. Francis I and Napoleon were the monarchs who had the most influence on the Palace as it stands today.. It is now a national museum and a UNESCO World Heritage Site. The Order of the Iron Crown was an order of merit that was established on June 5, 1805, by Napoleon Bonaparte under his title of King Napoleon I of Italy.